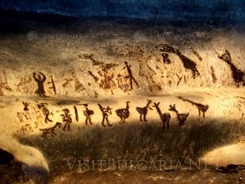 Tourists will be able to observe prehistoric drawings in the hall with prehistoric drawings in the Magura cave. The drawings, which number over 750, are located at 375 metres under the ground and, in order to preserve them, access to them has been limited. The images are multi-layered and date to various periods, from the Epipaleolithic, through to the Neolithic and Eneolithic, to the beginning of the early Bronze Age. The drawings contain images of dancing female figures, dancing and hunting men, masked people, a rich diversity of animals and plants, suns, stars and labor tools. Through these drawings, prehistoric people preserved information about religious calendars and the holidays by putting down their symbolic images, Mihaylov explained. The local authorities announced the program for the Tourism holiday on April 19th. All tourism attraction in Vidin region will provide free access to visitors. A Ukrainian delegation will visit Belogradchik during the period April 18-20 and its folklore ensemble will perform in Belogradchik, Vidin and Chuprene.